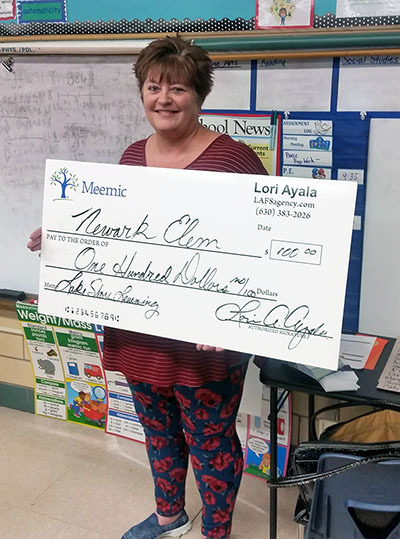 L.A. Financial Services presented Classroom Enrichment Grants to several teachers. Recipients of this grant can purchase up to $100 in classroom materials at Lakeshore, a leading developer and retailer of top-quality education materials. Congratulations to all of our winners! Shelley Schmidt at Emily G. Jones Elementary School in Plano. Claire Entwistle of Lincoln Elementary School in Oglesby. Tricia Frost of Fox Chase Elementary School in Oswego. Christina Hernandez of Boulder Hill Elementary School in Montgomery. Beatriz Marroquin of Boulder Hill Elementary School in Montgomery. Janette Maya of Boulder Hill Elementary School in Montgomery. Jami Weigand of Lakewood Creek Elementary School in Montgomery. 2019 © L.A. Financial Services, All Rights Reserved.